For those of you who have been fans of the blog long, you know that my oldest son Joshua is quite a Dapper Dan. He loves to look his best at all times, even if it means losing his wits if he can't find just the right pair of socks or bow tie to wear with his outfit that day. However, even though he likes to look his best, being a teenage boy, he has not always striven to smell his best. Until recently that is. He recently took a whole new stance on his grooming routine, especially the styling of his hair, so we headed off to pick him up some new products. Fall is the perfect time to rethink your son's or husband's grooming routine at CVS. 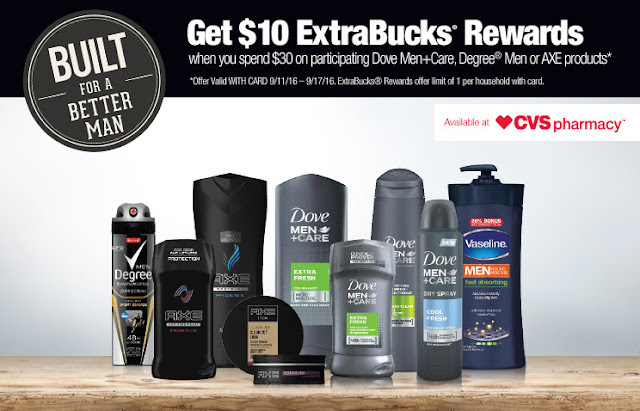 They have great specials, like right now, you can get $10 extrabucks® rewards when you spend $30 on participating Dove Men+Care, Degree® Men or Axe® products with the use of your ExtraCare card 9/11/16 to 9/17/16, limit one offer per household. The three products we added to Joshua's grooming routine were the Dove Men+Care Extra Fresh Body and Face Wash which fights skin dryness with a cooling agent and has an easy to rinse formula, the Degree Men Adventure Dry Spray Antiperspirant and Deodorant that provides 48 hours of odor and wetness protection. The last product we added was the most important according to Josh, the Axe Clean Cut Look Classic Pomade. Joshua recently got an all new haircut in preparation for our first trip overseas, and he wanted it to stay looking its best. The Axe Pomade has a medium hold and provides a shine finish, it works great for short and medium length hair and you only have to use a tiny bit each time. He loves that it doesn't make his hair too stiff or create a ton of build up of product, and I love that one container looks like it will last months and months! Check out the results with just a quick rake through his hair and style. Now, he is quite literally taking on the world as we tour London, Paris and Venice for three weeks, with confidence, knowing that he looks, smells and feels his absolute best in an environment that is not familiar to him. Want to help boost your man or son's confidence this Fall just in time for the holidays and back to school? Head in to you local CVS to save on these and more grooming products while sales last!